The top priority at every location in the Charles Gracie Jiu-Jitsu Academy Network is to provide the highest level of instruction in specifically Gracie Jiu-Jitsu and Self-Defense techniques and provide the highest quality of teaching and service to you as a student. There must always be, of course, the provision of true expert instructors and no one has access to more of them than the members of the Gracie Family who run all the best schools in Brazil since 1925. At the Charles Gracie Academy, you will receive the highest level of training and personalized attention directly by a senior member of the famous Gracie family of Jiu-Jitsu teachers and fighters who did so much to change the shape the current state of martial arts instruction in America. The Charles Gracie Academies are now located throughout all of greater Northern California and in Nevada. In the Bay Area we have San Francisco, San Mateo, and Daly City. In the Central Valley we have Tracy and Modesto. In the Truckee/Tahoe area we have our academy in Truckee; and, in Nevada we have our academy in Reno. Our students are welcome to train at any time in any of our locations. Charles has instructed members of the law enforcement officers, security professionals, U.S. armed forces, air marshals, as well as private citizens. Students come to train and improve their skills at our academy. Jiu-Jitsu, however, is for everyone, regardless of age, gender, body type or physical ability. By using leverage, balance and technique, a weaker individual can defend themselves against stronger, more physically capable opponents. Finally there is the ultra-competitive world of MMA or Mixed Martial Arts. Jiu-Jitsu is beyond an absolute must for any person who dreams of entering the world of MMA events. Without mastering the techniques of Brazilian Jiu-Jitsu, along with other Martial arts such as karate, judo, and kickboxing, they have no ability to truly and effectively compete in MMA. 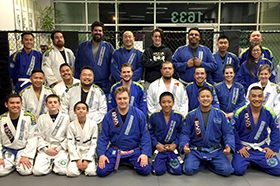 We are confident that Jiu-Jitsu will become one of the most cherished and enjoyable aspects of your life regardless of physical condition, age, or past experience. It will give you a confidence, knowledge and body-dexterity and fitness that few people will ever know. I look forward to sharing my family’s art with you! We look forward to sharing our art with you.